Good. 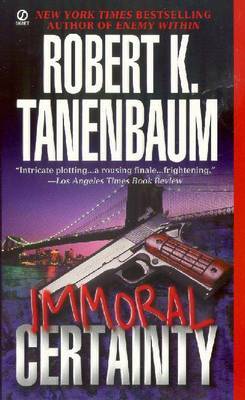 Immoral Certainty (Signet) by Tanenbaum, Robert, 1991-09-26. Mass market (rack) paperback. Glued binding. 397 p.
Good. 0451171861 Ships from Tennessee, usually the same or next day. Fair. 0451171861 Ships from Tennessee, usually the same or next day. Fair. A book in readable condition--All of our items have years of enjoyment left in them. It MAY contain writing or highlighting on pages, The cover may show wear and tear, and or stickers/residue different cover. Fast Shipping-Monday to Friday in Safe and Secure Bubble Mailers! Very good. No dust jacket as issued. Mass market (rack) paperback. Glued binding. 400 p. Audience: General/trade.